Sunscreen – Is it safe to use? 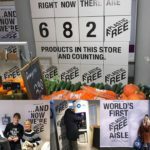 Plastic Free Shopping in The Netherlands! TAF’s visit to ICELAND- whaling or whale watching ? Update on the Faroe Islands’ tradition!